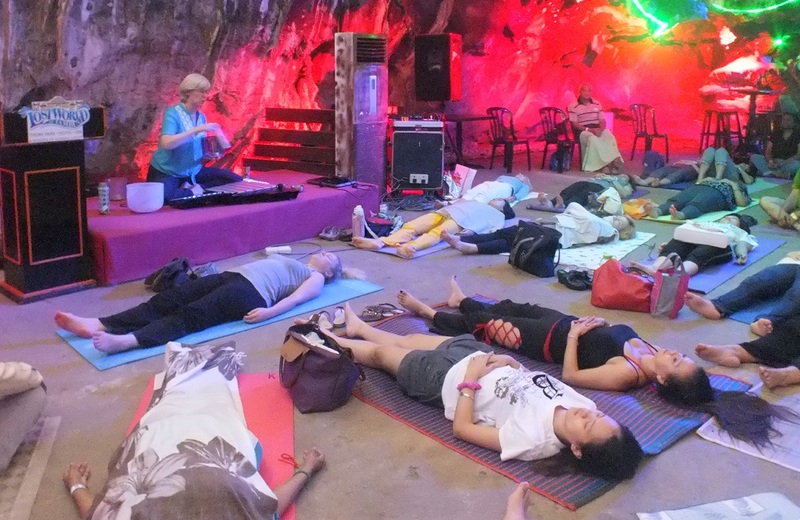 Sound baths are best experienced while lying down. Imagine entering a state of trance bliss – your heart rate, respiration, blood pressure, brainwaves and stress hormone levels decrease, allowing the body to heal both physically and emotionally. Doorways to altered states of consciousness open where you can receive insight and inspiration from your Higher Self and Divine Source/All That Is. Sound is heard not only with the ears but felt with every cell in our body. Anne uses an array of sound healing instruments including specially tuned Alchemy crystal singing bowls, xylophone, flute, crystal lyre, gong and voice to produce sound vibrations specific to each group. She is able to tap into the energy and needs of the group and create sounds that will shift blocked energy and restore balance. I found it soothing and relaxing. It destresses the body and mind of tension. The sound is not musical and yet its chime has a magical effect on the mind and soul. It produces a soothing effect on the brain in the serene atmosphere of the room. The sound makes the body want to abandon fatigue and stress. During the session, I tried to lift up my feet but found as if they were glued to the floor. After the session I felt energetic and could sleep soundly that night.